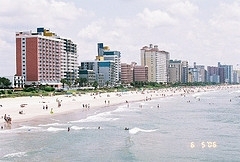 Myrtle Beach, South Carolina, long a favorite beach and golf resort, is now a rapidly growing community with over 300,000 people in the Metro. 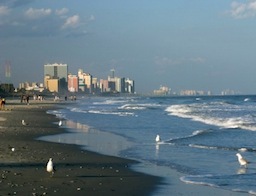 Myrtle Beach's Grand Strand, which stretches for 60 miles, is one of the finest stretches of beaches in the word. It also offers sensational golf, fishing, shopping, and more than 1800 restaurants. Many people who settle here are northerners looking for a warmer climate.